One thing @btuniverse would like its readers to know is the fact that its parent organization, BuildTeam is supportive of all Graphene based blockchains. This includes but isn't limited to Bitshares, Steem and EOS. It is because of our passion for building and unity that we continue to support efforts that bring the chains and their leaders together. There is strength in numbers. In our last article we discussed some of the outstanding work on the Steem blockchain taking place by its developers. In this article we'd like to focus on EOS, another high potential blockchain that has a real shot at disrupting centralized networks in favor of its decentralized approach. New projects take time to really get all their ducks in a row. It is certainly true that this applies to EOS when we attempt to count all of the struggles and controversies surrounding it. For example, the stop-and-go launch which seemingly took ages to complete. After that there was quite a bit of controversy surrounding locked accounts. Beyond that people had been scammed and tricked into giving away their private keys. In addition people were surprised when orders were made by an "arbitrator" that many in the community hadn't realized existed (the entity referred to as ECAF). Because of all these mishaps and the clear lack of leadership and resolution found in the EOS community, Dan Larimer decided to propose a whole new governance structure or "constitution." The problem the community faces when it comes to deciding upon a new governance structure is the fact that Dan hadn't taken the time to direct Block One to actually create and incorporate a system into EOS that would allow its community to vote on a constitutional change. Perhaps one of the biggest disappointments of all that community members face is the powerless nature for smaller users to change anything about it. The voting scheme put in place favors huge early adopters and as a result the block producers (BPs) that are chosen aren't necessarily working in the best interests of the greater community. In fact many would say that several of the BPs that have been voted into the top slots aren't following all the rules of the constitution in charge. Some have been very vocal about their feelings regarding the current state of EOS. "I'm a really big believer in the potential of EOS and of EOSIO software, and I came to believe that it was on a bad path." This is what Douglas Horn had to say when asked about his feelings regarding the state of EOS. To go one step further Horn wanted to make more than a statement, he wanted to affect change. He also thought he could do better job and rise above the current paradigm. He was so passionate in fact that he began working on a project called Telos, a fork of the open-source protocol behind EOS called EOSIO. There are now several groups working with the software making changes in an effort to set up a brand new network. Although we are still in the early stages, Telos already has a testnet set up and quite a large community on Telegram. They also are supported by a huge number of well established BPs. It isn't just Telos in the works, there are more forks planned as well! EOS Force is another example. They propose an EOSIO-based main chain with side chains incorporating features of ethereum, zcash and cardano. Another is ONO, a social network that was going to launch on EOS, but decided to fork it instead. EvolutionOS, which aims for more even token distribution and lower RAM prices, is airdropping ethereum-based tokens and plans to launch its own EOSIO-based blockchain. Beyond the projects mentioned above two other projects with a lot of potential going down the same road include both WAX and Worbli. Most believe that Telos has the greatest chances at the moment but personally I've reviewed Worbli's roadmap and I'm extremely impressed with their project as well. According to Horn, Telos' launch could come as soon as next month, with the aims to make two significant changes to the EOS that exists today: curtail the power of the largest token holders known as "whales" and launch with more solidified governance mechanisms that can be enforced directly on the blockchain. The first thing that stands out about Telos is the decision to cap the number of tokens any one address receives during the initial distribution at 40,000 (with certain exceptions). Will the capping of tokens to 40,000 per snapshot holder do a better job when it comes to distributing votes? A lot of people believe it will. Time will tell if that is the winning strategy to get a blockchain that developers really want to be a part of and build upon. There is a lot of positive sentiment when it comes to upcoming EOS forks. "I think that competition is good for the ecosystem," Daniel Keyes, from EOS Nation. A Reddit user was also very supportive in saying, "I welcome the chance to see how it plays out. Perhaps they will try out some things that work and all of us can become better for the experiment." So get out your forks and knives crypto enthusiasts, dinner is about to be served, the question remains, which flavor of EOSIO do you prefer? 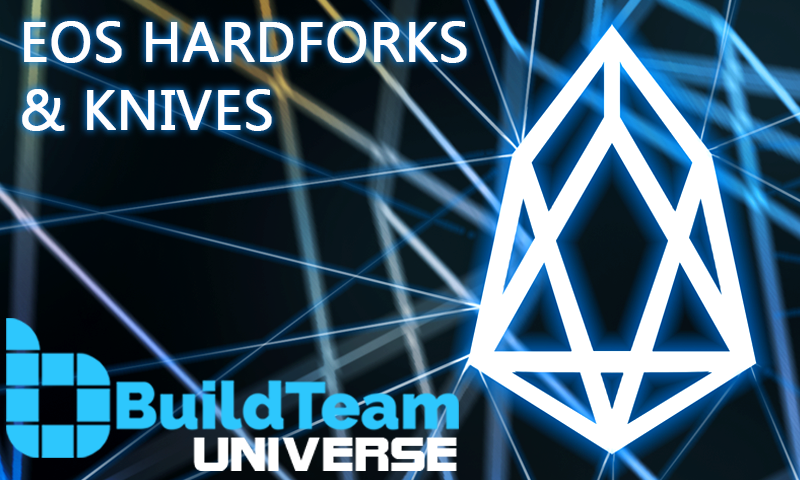 Vote Buildteameos for top 21 EOS Block Producer! I think with telso having 1/3rd the token supply and to be honest better then eos it could easly go to a few dollars a token. Agreed. In the end its all good for business. Worbli? Who came up with that name? I am still on the fence about EOS, I got enough to setup an EOS name for Trybe but not really convinced EOS and mass adoption will ever be spoken in the same sentence. EOS really need to step up their resource game. If you want to learn Solidity there's so many resources available compared to EOS. Bummer that the original EOS is turning out to be a bit of mess because of the governance and constitutional issues. It seems that once Dan left Steemit, he stopped paying attention to the issues arising here, which are to my mind, very similar. There are valuable lessons that could have been learnt and applied. Hopefully one of these forks will get it right.